to create in the late 1960s. He moved to Southern California in the fall of 1970 to teach at California State University, Long Beach, and spent the following year in Santa Monica, surrounded by artists who had similarly begun to incorporate photography in their exploration of conceptual art. In addition to his dog Man Ray, the first of many Weimaraners he would own over the course of the next several decades, Wegman featured himself in these early photographs, using mirroring, doubling, or language to suggest before-and-after scenarios or other narratives. 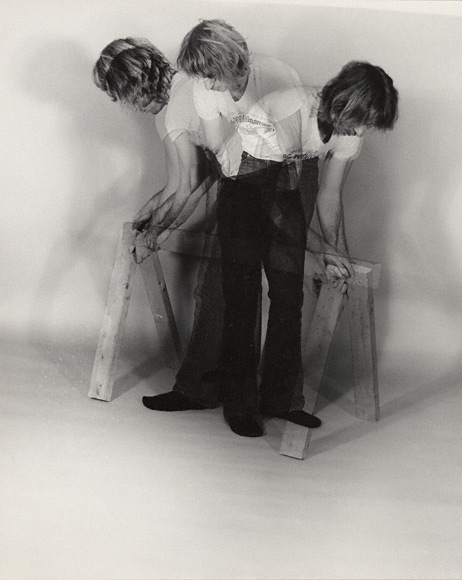 An element of the absurd is introduced in this multiple exposure in which the artist busies himself with the construction of a sawhorse.